We do not have a choice. A HOTTER future is coming because of climate change. Now, we are only left with the question of how we will adapt to it. This is the sentiment of the new book by Matthew Kahn entitled: Climatopolis: How Our Cities Will Thrive in the Hotter Future. We do not have a choice. A HOTTER future is coming because of climate change. Now, we are only left with the question of how we will adapt to it. This is the sentiment of the new book by Matthew Kahn entitled: Climatopolis: How Our Cities Will Thrive in the Hotter Future. His perspective is that climate change is coming…or in fact, already here. All you have to do is look at photographs of the disappearing glaciers, the erratic weather patterns and the Pacific island that are already being affected by sea level rise. Kahn argues that we will cities and densely populated areas will be the battleground for human adaptation for what “Mother Nature with throw at us”, and he believes we can find ways to…not fight back…but actually integrate the new reality of global change without making mama any angrier. I had a chance to catch up with Kahn in New York City to discuss his views and how he sees the future unfolding. In an excerpt from Chapter 1 of the book, Kahn compares us to “the Titanic on the night of April 14th 1912”. He goes on to say that we all know the way the story ends with the then-largest passenger steamship. It is easy to assume that if the watchmen abroad would have seen the iceberg in the distance, they would have surely changed course. A slight navigational tweak would have meant the difference of one of the most tragic stories in history being avoided. Kahn focuses on the city as the source of much needed attention…that unlike the steel boat that was bent on being the fastest ship to sail between England and New York, urban areas are where most people live today and that the trend of more people living in these areas will only increase. Because the different cities in different countries and regions are not all the same, Kahn highlights that developing fundamental action plans that adhere to each location’s unique conditions is the best recipe for thriving in the decades to come. I find his comparison of human society to the Titanic revealing…and I wonder if he has a sense of what is the exact hour on the night of April 14, 1912 our society sits. I also find it interesting that it was an iceberg that sank the Titanic…the result of a cold winter, and climate less in flux. As the story goes, the ship head ran into trouble around 11:40pm…and so if Kahn sees us at 7pm or 10:55pm, it makes a lot of difference for how optimistic he really is about the future. Of course, as the planet heats up, transatlantic ships will be less and less likely to sink due to large pieces of ice – a strange and bit eerie twist. Because if the Titanic were to set off on her maiden voyage today, it might be one of the few benefiters of global warming. 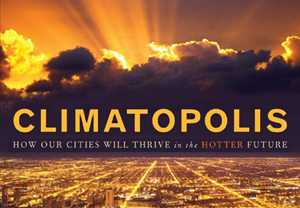 Either way, Climatopolis is a compelling book that searches and explains how cities will fare over the next several decades as we face the challenges of a much hotter world. His background as a economist allows him to do more than only look at increases on a thermometer. He takes the temperature of economies, current events and other topics. He advocates, in fact, that technological innovation needs to match the greenhouse effect, and heat up too. With breakthroughs in science, communication and other technologies, Kahn sees the opportunity for sustaining and creating a livable planet. This post was written by Neil Chambers, in collaboration with our friends at TreeHugger, the leading online destination for the news and ideas that are driving sustainability mainstream.